Chilean Dolphins are a very a relatively unknown species of small dolphin that don’t like to spend too much time associating with people. The Chilean Dolphin is a member of an exclusive group of four species. This group includes the Commerson’s Dolphin, the Heaviside’s Dolphin and the Hector’s Dolphin. 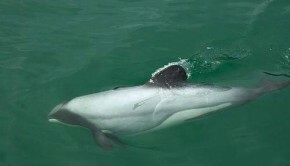 The Chilean Dolphin is one of the smallest dolphin species. Because of this it sometimes is mistakenly identified as a porpoise. The dolphin is a mixture of dark black and grey with a white underbelly. The Chilean Dolphin is relatively stocky and its dorsal and pectoral fins are proportionally much smaller than other species. Both fins are also very rounded in appearance. Chilean Dolphins have very short snouts or beaks. Chilean Dolphins eat a wide variety of foods such as fish, crustaceans, algae and Cephalopoda. They seem to have a strong preference towards relatively shallow water of less than 200 or so, metres (600 feet). Very little is known about these dolphins. This is exacerbated by Chilean Dolphins’ reluctance to interact with humans in the same manner that other dolphin species do. No doubt this shyness is related to the fact that these dolphins are probably still hunted by certain fishermen. Chilean Dolphins are considered to form groups of between two and 15 individuals. Nonetheless, like many cetaceans, they also can congregate in huge numbers. One group of 400 has been spotted as well as a scarcely credible sighting of a 25 kilometre (15 miles) long pod. This group was believed to have been as large as 4,000-strong. The Chilean Dolphin population is estimated to be lower than ten thousand and they are classified as Near Threatened. Up to up to 1,500 Chilean Dolphins were killed per year in the 1980’s. Despite the fact that hunting is not permitted, it is still maintained that some fisherman, who are living close to poverty, hunt the dolphin species. Two of the biggest threats apart from direct fishing include accidental entanglement and pollution. Chilean Dolphins are up to 1.7 metres (five and half feet) in length. They weigh roughly 60 kilograms. Chilean Dolphins are found off the coast of Chile. They are not thought to migrate anywhere else. They can live to be as old as 20 years. Visit Wikipedia for more information on the Chilean Dolphin. There are so many interesting dolphin species out there! And unfortunately many that we’ll never get to know if we allow them to die out. Thanks so much for sharing this! Thanks for your kind comment, Jessica. Your pictures and the tale of your experience with the Pink Dolphins was great.